I am always experimenting with new materials. Here is what I am currently using. For smaller paintings or working on detailed areas, I turn to the ParellelPALETTE, an amazing vertical mixing system that allows you to see your painting and your color mixtures side by side in the same light. I mount it to my easel using a Manfrotto Magic Arm and Super Clamp. Linen panels - I use Raymar double-primed Claessens linen, or Centurian oil primed linen panels. Both brands are excellent! When I want to my make my own custom linen panels, I mount Claessens #13 linen to hardboard using Miracle Muck. I use a variety of high quality paints. This list below are my current favorites. Paints with an asterisk (*) are almost always on my pallette. Good lighting is a must! I try to have the same temperature light on my canvas and palette as on my model. I work with a couple different lights: a fluorescent daylight-balanced softbox set-up on a boom stand (available through Cowboy Studio, see below), and an LED temperature-adjustable light from Aputure, which I usually have set to 4500K. These lights offer cool lighting that comes as close to natural north light as one can get. I use an 8x10 Open Box M (with a Pelican case), for plein air/hiking. I use an Edge Pro Paintbook for all other times when I need to pack up my gear and take it somewhere (i.e. for open studios, portrait demos, etc. ), but it's awesome for plein air as well. Learn to Paint like Anna! 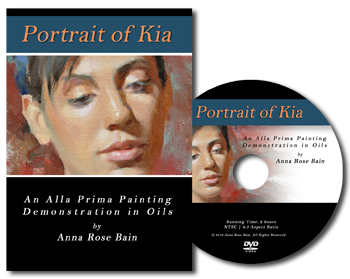 View videos of Anna explaining her painting techniques here! First painting of 2013: "Lullaby"